ooooo, love the red one. I went through a thrift store phase when we lived together in the goose house actually. I have a few treasures that I still wear. i do love thrifting! and i really love your skirts. sadly, i haven't had much luck with clothes. New reader-love your blog :) Thrifting really is a rush, fun and intriguing in so many ways. Those skirts wow-stunningly good finds. You will smile every time you put them on, I'm sure. $4 makes the perfect fit that much more satisfying,doesn't it? great finds! i'm a huge fan of thrifting. the experience makes the purchases so much better! That mug is a lot of fun and I really like your red skirt! I like thrift shopping, but sometimes it's really hit or miss. It seems that I find nothing at all for weeks on end, but then suddenly I'll find so many great treasures in a lot of different departments. I'm in love with your blog and the sweet design!! 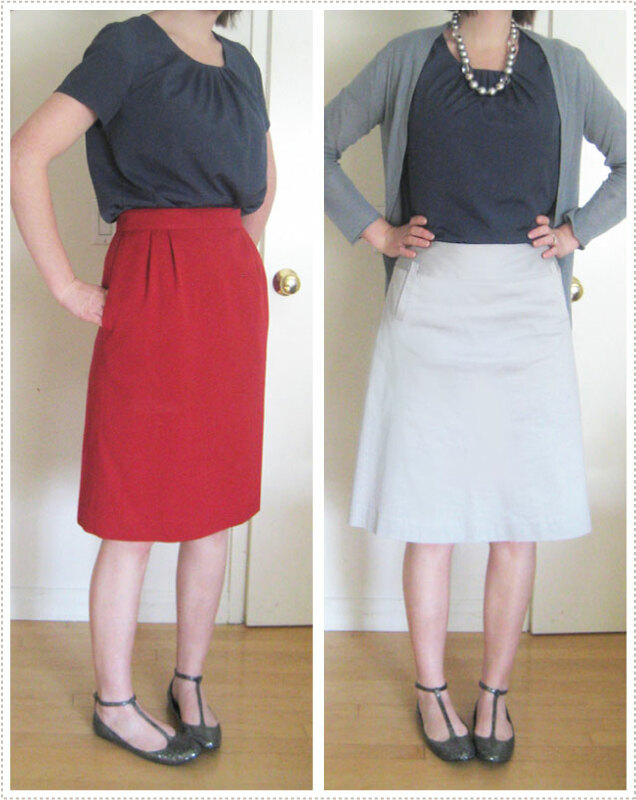 You found some awesome thrift goodies, my favorite has to be the red pleated skirt. I'm wondering, where did you find your shoes?!? I'm obsessed with t-strap shoes!!! Thanks Melissa. I got my shoes at urban outfitters. They have great shoes right now. I love your taste. I can't put an outfit together to save my life. I love the skirts, love the look! 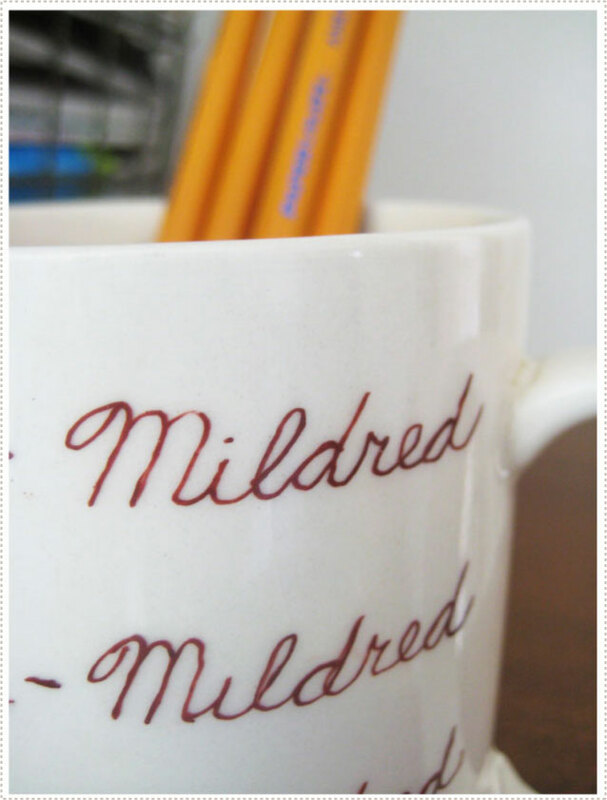 Aw, my maternal grandmother's name was Mildred. The name is kind of novel since no one is named Mildred these days. Mildred is just such a great name. I wore a thrifted find yesterday. I actually was with you when I found it! I'm a new reader, and I am loving reading back through your posts! 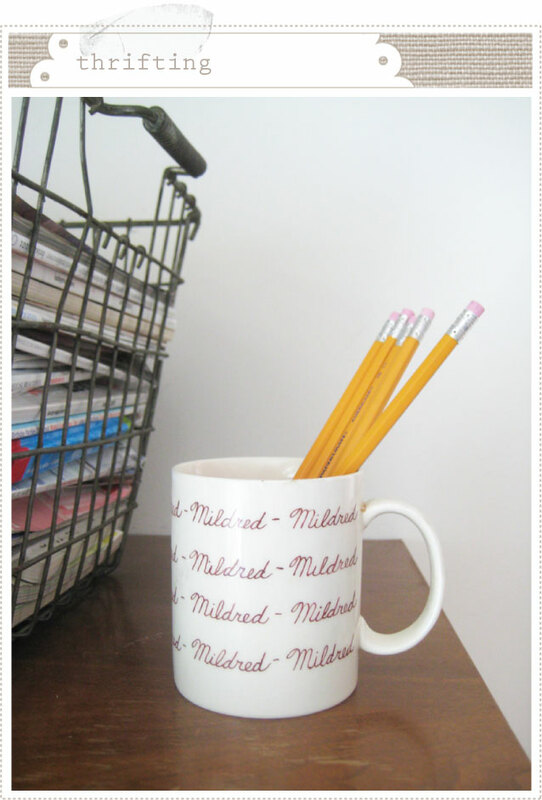 If you ever need someone to take the Mildred mug off your hands, I'm your girl. My Aunt Millie's name is (obviously) Mildred, and it would thrill me to no end to find something like that to surprise her with! It was her mother's name (my maternal grandmother) as well.